Palmer has been at the forefront of great American food since the '80s. Fresh local ingredients, bursts of flavor, and preparation with ease have been the hallmark of his cooking over the years, and this collection includes the best recipes he cooks at home and his restaurants. 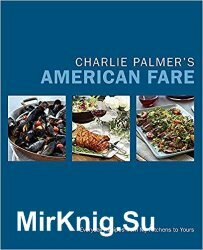 Included will be over 100 recipes that any cook can make with ease-from Charlie's Famous Corn Chowder with Shrimp to Cheese Strata to Prosciutto-Wrapped Zucchini to Baked Lemon Chicken; plus snacks like Crispy Chickpeas and desserts like Double-Trouble Chocolate Chip Cookies, Lemon Shortbread and Fig Crostata. Along with personal reflections on food and family from one of America's own top chefs, this cookbook will help every family with delicious, easy dinner ideas.